Tag line: "300 Feet. One Breath. No Second Chances"
Breathe, a 2011 documentary directed by Martin Khodabakhshian (a 9-time Emmy Award-winning producer for cable network ESPN), follows Free Diving world record holder William Trubridge as he attempts to do something nobody has ever done before: dive to a depth of 300 feet (92 meters) with no equipment, and on a single breath of air. The setting for this historic attempt is the Bahamas, more specifically an area known as Dean’s Blue Hole, a deep cavern situated smack-dab in the middle of a picturesque bay. This hole, which plunges to a depth of 663 feet (202 Meters), is where Trubridge spends a fair portion of his time training (he and his wife live in the Bahamas), and he even hosts a Free Diving competition, known as Vertical Blue, that brings dozens of the world’s most conditioned athletes to the Hole each and every year. Breathe tags along with Trubridge as he trains for his big dive, revealing how he prepares himself, both physically and mentally, for a feat that may ultimately cost him his life. Even more interesting than the dive itself is the man at the center of it all, and it’s the attention it pays to William Trubridge that makes Breathe as engaging as it is. In what might be the movie’s most fascinating scene, Trubridge reveals his secret for staying under water for long periods of time, explaining how he uses both his lungs and his diaphragm to take in air (when his lungs are full, he forces himself to “swallow” air, claiming the process allows him to pull in an additional half-gallon of oxygen). Yet even with his extensive training, there’s no guarantee Trubridge will survive each new attempt, a reality that weighs heavy on the minds of those closest to him (both his wife and father are interviewed during the course of the film, and talk of how they fear for his safety each time he goes down). As to why he does it, not even Trubridge can answer that question (when asked by the director why he takes such risks, the famed diver silently peers off into the distance). 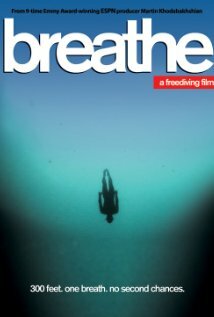 Bolstered by its stunning underwater photography and Khodabakhshian’s unique visual style (which involves lots of slow-motion), Breathe is a captivating, beautiful documentary. But as aesthetically pleasing as the movie is, and as dramatic as its final scenes are, it’s the time it spends with Trubridge that makes Breathe such a rewarding experience.